A neuron ( /ˈnjʊərɒn/ NEWR-on; also known as a neurone or nerve cell) is an electrically excitable cell that processes and transmits information by electrical and chemical signaling. 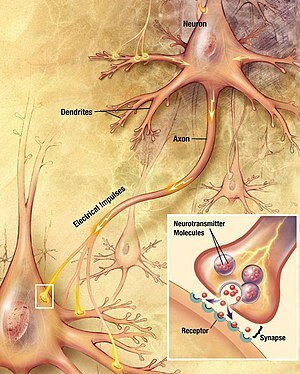 Chemical signaling occurs via synapses, specialized connections with other cells. Neurons connect to each other to form neural networks. Neurons are the core components of the nervous system, which includes the brain, spinal cord, and peripheral ganglia. A number of specialized types of neurons exist: sensory neurons respond to touch, sound, light and numerous other stimuli affecting cells of the sensory organs that then send signals to the spinal cord and brain. Motor neurons receive signals from the brain and spinal cord, cause muscle contractions, and affect glands. Interneurons connect neurons to other neurons within the same region of the brain or spinal cord. A typical neuron possesses a cell body (often called the soma), dendrites, and an axon. Dendrites are thin structures that arise from the cell body, often extending for hundreds of micrometres and branching multiple times, giving rise to a complex “dendritic tree”. An axon is a special cellular extension that arises from the cell body at a site called the axon hillock and travels for a distance, as far as 1 m in humans or even more in other species. The cell body of a neuron frequently gives rise to multiple dendrites, but never to more than one axon, although the axon may branch hundreds of times before it terminates. At the majority of synapses, signals are sent from the axon of one neuron to a dendrite of another. There are, however, many exceptions to these rules: neurons that lack dendrites, neurons that have no axon, synapses that connect an axon to another axon or a dendrite to another dendrite, etc. With the exception of neural stem cells and a few other types of neurons, neurons do not undergo cell division. In most cases, neurons are generated by special types of stem cells. Astrocytes, a type of glial cell, have also been observed to turn into neurons by virtue of the stem cell characteristic pluripotency. In humans, neurogenesis largely ceases during adulthood—only for two brain areas, the hippocampus and olfactory bulb, is there strong evidence for generation of substantial numbers of new neurons. Pyramidal neurons (pyramidal cells) are a type of neuron found in areas of the brain including cerebral cortex, the hippocampus, and in the amygdala. Pyramidal neurons are the primary excitation units of the mammalian prefrontal cortex and the corticospinal tract. Pyramidal neurons were first discovered and studied by Santiago Ramón y Cajal. Since then, studies on pyramidal neurons have focused on topics ranging from neuroplasticity to cognition. Transmembrane channels, also called membrane channels, are pores within the lipid bilayer of the cell membrane. The channels are formed by large protein complexes that run across the membrane connecting the cytosol, or cytoplasm, to the extracellular matrix. Transmembrane channels are also found in the membranes of organelles including the nucleus, mitochondria and lysosome. Transmembrane channels differ from transporters and pumps in several ways; channels are not as selective as transporters and pumps, differentiating solutes primarily by size and ionic charge. Channels perform passive transport of materials also known as facilitated diffusion. Transporters can carry out either passive or active transfer of materials while pumps require energy to act. There are several modes by which membrane channels operate. The most common is the gated channel which requires a trigger, such as a change in membrane potential in voltage-gated channels, to unlock or lock the pore opening. Voltage-gated channels are critical to the production of an action potential in neurons resulting in a nerve impulse. A ligand-gated channel requires a chemical, such as a neurotransmitter, to activate the channel. Stress-gated channels require a mechanical force applied to the channel for opening. Aquaporins are dedicated channels for the movement of water across the hydrophobic interior of the cell membrane. Ion channels are a type of transmembrane channel responsible for the passive transport of positively charged ions (sodium, potassium, calcium, hydrogen and magnesium) and negatively charged ions (chloride) and, can be either gated or ligand-gated channels. One of the best studied ion channels is the potassium ion channel. The potassium ion channel can allow rapid movement of potassium ions while being selective against sodium. Using X-ray diffraction data and atomic model computations a likely structure of the channel consists of a number of protein alpha-helixes forming a hourglass shaped pore with the narrowest point halfway through the membrane’s lipid bilayer. To move through the channel the potassium ions must shed their aqueous matrix and enter a selectivity filter composed of carbonyl oxygens. The potassium ions pass through one atom at a time along five different cation (positively charged ion) binding sites. Diseases caused by ion channel malfunctions include cystic fibrosis where the channel for the chloride ion will not open or is missing in the cells of the lungs, intestine, pancreas, liver and skin. The cells can no longer regulate salt and water concentrations resulting in the symptoms typical of the disease. Additional disorders resulting from malfunctions in ion channels include forms of epilepsy, cardiac arrythmia, certain types of periodic paralysis and ataxia. 12. Schizophrenie, Depression, Agnosien etc. 13. “High-level” – Verarbeitung: Was macht der Cortex?